This course prepares you for the exam leading to the Business Relationship Management Professional Certification. The Business Relationship Management Professional (BRMP®) training and certification programme is intended as a comprehensive foundation for Business Relationship Managers (BRM) at every experience level, with the training and certification designed to provide a solid baseline level of knowledge regarding the BRM role and how well-cemented and effective BRM disciplines can positively impact overall business results. The “Foundation” supports the BRM role and ensures it has the competencies to be effective and deliver value to both the provider organisation and its business partners. 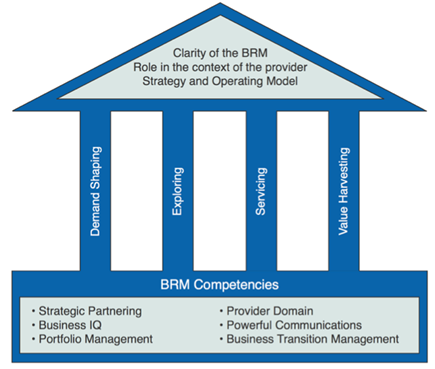 The “Pillars” define the BRM space in terms of Core BRM Disciplines: Demand Shaping, Exploring, Servicing and Value Harvesting. The “Roof” protects Business Relationship Management as a key aspect of provider capability. It does this by ensuring clarity around the role, discipline, and organisational capability of Business Relationship Management in the context of the Provider Strategy and Operating Model. A complement to the course, but not mandatory or required is the publication The BRMP Guide to the BRM Body of Knowledge. It can be purchased directly through Van Haren Publishing or on Amazon. If you are a member of the Business Relationship Management Institute, you are able to download a copy of this guide for free on the BRMI campus homepage. A special 50% discount on the BRMI membership fee is available to all customers who purchase this course. Details of how to take advantage of this discount will be included in the confirmation letter you’ll receive after registering for the course. Many of our courses are available in a self-paced online learning format – meaning you can learn from your computer anywhere, anytime, at your own pace! Unlike many others, our self-paced courses are a comprehensive, very rich learning experience – almost like being in a classroom! And, they consistently receive rave reviews. Subscriptions are for 3 months from the date your account is activated.